This mini barrel collar is perfect for smaller dogs. It has a 28-inch leather strap and a solid wooden barrel that comes with free personalization. 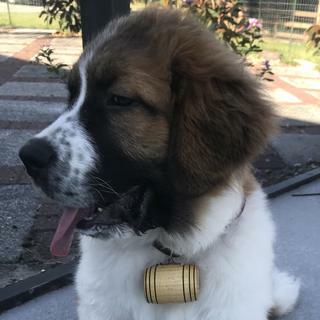 If you like the look of a St. Bernard barrel collar, but don’t have the giant St. Bernard dog to go along with it, this mini barrel (perfect for smaller dogs) is just what you need. The 28-inch leather strap fits most dogs, but if it’s too long for your canine companion, you can easily cut it and add additional holes. 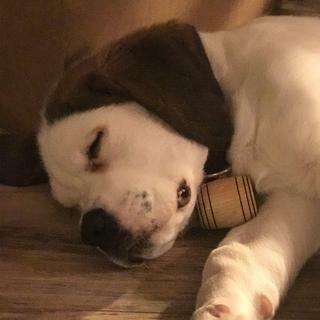 The mini barrel is made of solid wood and comes complete with available free personalization so it can double as an ID tag for your pooch. Barrel collars aren’t just for big dogs anymore! For any breed from basset hounds to bulldogs, this mini barrel is a fun conversation starter and the perfect accessory for your lovable pet. I ordered this for my friends St. Bernard for Christmas. It came without the engraving first. So, I submitted a request to their customer service email for their return/exchange policy. I received a call the next day. They apologized for the error and promised to send me a new one right away. All together, it took about 2 weeks from the time I placed the order. Very quick service and shipping. Extremely friendly. I would definitely recommend! 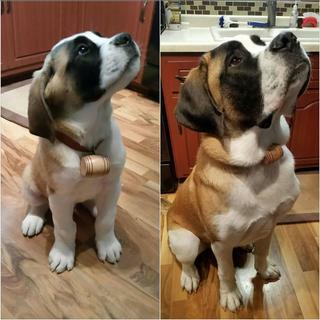 At 1 year old the leather band barely fits around our Saint Bernard's neck, so we will need to find another strap. But the barrel does look very cute, and they did a very nice job with the engraving. I think it would be very nice if there was a size between the mini and the larger barrel. Louie at 2 months old and 1 year old. The barrel is definitely awesome, however the leather strap is super cheap and doesn’t have enough holes in it. My puppy managed to get a paw into it and rip it within minutes. Just be aware that the strap or collar is poor as a leash holder.We doubt it will even suit as a keg holder. very expensive with out a proper collar. Just to bad. I'm sorry to hear that you were disappointed with the quality collar. We will definitely pass your feedback on to our product team and the manufacturer. I hope you were otherwise happy with your experience with KegWorks. We appreciate your feedback and your business. Cheers! Thank you for your feedback. Sorry to hear the collar doesn't fit your dog, that is definitely disappointing! If the ring attached to the barrel is too small to fit through a larger collar, using a split ring to connect it to the ring of a larger collar might work. I've done something similar for my dog, I hope it works out for you. We do appreciate your business and hope you shop with KegWorks again! Very cute but take photos quick because they will chew it quickly. Looks awesome and makes Brutus even cuter. I love this barrel. It is just perfect. A little disappointed because the ring on the barrel is too small for the collar needing an additional larger ring to attach to the collar. Item was not ready to place on dog's neck until I can go shopping to find a larger ring. Otherwise the barrel is really cute and will look really good on my St Bernard Pups. I thought it was a real keg to fill up. I'm sorry to hear of the confusion. We do offer a full-size barrel collar that can be filled, but not personalized. We'll look to update the photos to help accurately represent the item. 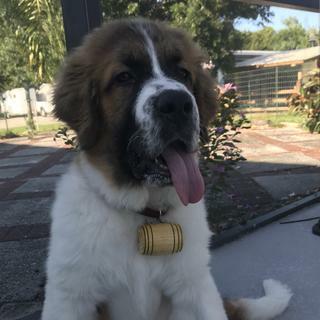 Getting ready to bring my new Saint Bernard home and thought this would be a unique collar for her! Can't wait to try it on her. I have 2 St. Bernards, Oliver is the dad and Henry is the son. We wanted to get these as a keepsake for my Mom/Stepdad. Oliver is turning 11 next month and we just discovered the saint bernard stuffed dog you can get instead of the elf on the shelf so we think its a cute idea not just for the dogs to wear but something for them to save forever. I am very excited to get these and show them. His name & awareness of chip information. Me and my boyfriend have a st Bernard and think this will be cute. I have a 100lb 10 month old st. bernard and this would look great on him!! This was extremely easy to order and I had a great experience with this company! Because it's so cool looking!! 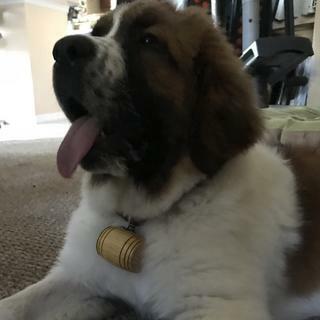 I have a huge St Bernard and I just thought that the mini barrel collar charm would look adorable on him. It is very cute. BEST ANSWER: It's solid. It doesn't hold anything. It's quite adorable, though! it is a dog collar and no, it does not hold any type of liquid. Unfortunately, no. It's solid wood. no, it is a solid piece of wood. Hi I have a 6 month old St Bernard Australian Shepherd mix I don't like the big barrels but will this 1 be to small?He's a big boy. BEST ANSWER: I bought this for my friend's female St. Bernard (weighs about 120) and it was actually perfect. Not too big, not too small. But that's just my opinion! I don't have any pictures of her, sorry. Is he past the chewing phase yet? If not save the money until he gets bigger. 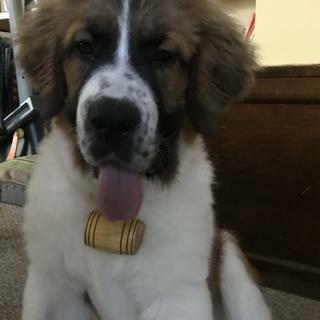 I have a St. Bernard and at the same 6 months I got him the little barrel and he chewed it up in minutes. I plan on getting the bigger barrel soon. It looks great for quick pics but I would leave it on him for too long. Just get the plain barrel and you can get it engraved if it survives. How big is your puppy now and how big is he supposed to get? Will he wear it all the time? Personally I think it's a nice size. I wish I could attach a pic of them wearing theirs. It looks really cute on. Hi there! Yes, I'd say so. it's really small. Beautifully made though. It looked cute when our Saint was just a little pup- which was for about 5 minutes. LOL! I have had a hard time finding one in the middle.....they are either too small or tooo big. This is really small, I put it on my mastiff and you could barely notice it. Hope that helps! i have a bichon frise, is this going to be too heavy for her neck? BEST ANSWER: WE HAVE A CHOW-WEENIE (A CROSS BETWEEN A CHOW-HUA-HUA AND A WEENER DOG) APPROX 20LBS. HIS LITTLE KEG DOESN'T BOTHER HIM A BIT. VERY CUTE, ENJOY. DEB. ahh, such a relief. Thanks for your comment :) I'm excited to get this, I ordered it yesterday. One is 95 and other 85 lbs? BEST ANSWER: I don't know that it comes sizes, but, if it helps, I bought one for a 120 lb. St. Bernard and a 70 lb. Yellow Lab. It fit them both just fine because it's adjustable. I would suggest the mini collar. 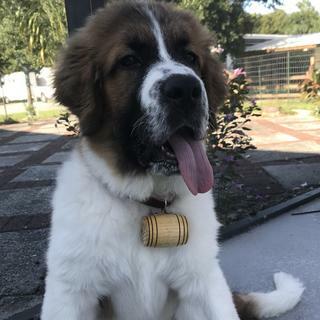 It looks very nice on my 125lbs Saint Bernard. The larger barrel might be a bit too big. Do your sell just the barrel? If so, is the price different? BEST ANSWER: The barrel is not sold separately from the collar. Can somebody give me a comparison of the barrel size to something like a CD or phone? BEST ANSWER: Hi Leslie, I compared it to my iPhone 6. It's about the same width and 1/3 the height. I would say it's about the size of a large shot glass. Here are the exact dimensions, if that helps. Cheers!